Petaluma Wetlands Site  marsh at lower left; water channel and mud flat at low tide with feeding birds, center; Sonoma Mountain, upper left; polishing (treatment) ponds and agricultural fields are on dry land in middle distance; tree-lined Ellis Creek at top right. 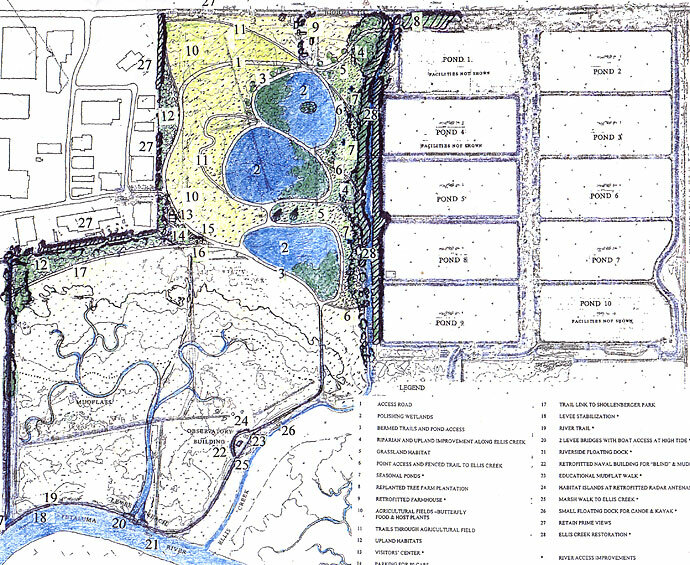 Butterfly oxidation ponds  plan from the Environmental Impact Report. In 1969 I made a small drawing called "Municipal Water Gardens: Channels", a public landscape that created wildlife habitat, processed sewage, and welcomed visitors. 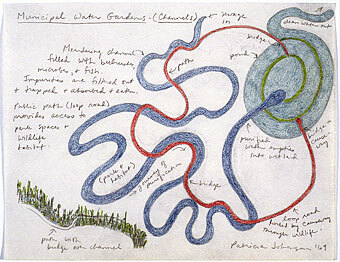 The image depicts three interwoven snakes: a narrow sculptural path with bridges and causeways; a wider meandering channel filled with bulrushes, microbes, and fish; and a "coiled" circular pond with spiral causeway, where purified water empties into a wetland at the end of the process. The drawing speaks to design issues, but also to making the world whole. As the sewage proceeds on its "journey of purification", detritus and toxins are filtered out, trapped, absorbed, and eaten by a wide variety of plants, microorganisms, and creatures  the same vegetation and wildlife that animates the park. These multi-function landscapes have always appealed to me because they are not only beautiful and useful, but also productive and life supporting. They are places that tend toward evolution rather than maintenance, and recall an earlier period when humans fit into their landscapes, rather than dominating them. I am currently working with Carollo Engineers on a new $95 million dollar water recycling facility for the city of Petaluma, California. The project has now expanded beyond the original oxidation ponds, treatment wetlands, and polishing ponds  landscapes that process sewage  to incorporate a new 272-acre "Petaluma Wetlands Park". As a designer I have always been interested in creating a sense of the journey, as well as enmeshing human creation within the larger patterns and purposes of the natural world. In Petaluma, art and infrastructure, ecological nature and the public landscape, are unified within the image of one of the area's smallest inhabitantsthe "California Dogface Butterfly". More than three miles of public trails and interpretive sites trace the patterns of the insect, while revealing the intricacies of wastewater treatment, the tidal cycle, ever-changing patterns of land and water, and the complex relationships between ecosystems in each particular time and place. At the heart of the Wetlands Park, three elevated bermed ponds totaling 45 acres form the butterfly's "dogface" image. The primary purpose of wetlands in the treatment process is to remove algae, nutrients, and heavy metals from the wastewater, but filtration marshes also produce a higher quality effluent  water that meets the standards of tertiary treatment for unrestricted use  while accomplishing these goals in a low-tech, energy-efficient way. Our ponds have also been designed to provide maximum usage by wildlife. Habitat islands in each cell offer protected nesting and refugia for birds, while also directing the flow of water in the basins. And as the sequence of ponds moves through varying ecologies, from upland habitats toward the river, the character of the trail, public accoutrements, and islands changes. Thus the pond closest to the highway is heavily vegetated to reduce noise and visual intrusion, and features islands of trees and shrubs to provide perching and roosting habitat for predators such as herons, hawks, and owls. Grassy islands in the middle pond are ideal for nesting ducks. And barren islands of crushed oyster shell in the pond closest to the river, overlooking an open expanse of mudflats, will be used by shorebirds such as stilts, avocets, and terns. The aesthetics of wastewater treatment is further defined by terraced banks, which allow a greater variety of plants to grow, and by broad "green" bands of vegetation, alternating with "blue" bands of deeper open water (habitat for predatory fish). Within the green zones, suspended solids are being consumed by microscopic aquatic animals and insects that live on plants-- creatures that play a major role in moving energy through the food chain. Aquatic plants pump oxygen into their submerged stems, roots, and tubers, thus supplying the microbial decomposers. By actively incorporating nitrogen, phosphorus, and metals, plants also help purify wastewater, while offering food, shelter, and nesting materials to myriad species within the littoral zone. Aesthetic structures along the twelve-foot wide berms include the trails themselves, beaches for wading birds, and benches, blinds, and overlooks for humans-- all modeled on local flora, fauna, and landforms. Looking out over the landscape from high points around the polishing ponds reveals a mosaic of ecosystems. To the north and west, agricultural crops (corn, barley, and alfalfa), left standing for wildlife, define the upper "wing" of the butterfly. Narrow paths threaded through the fields complete the "dogface" image and provide an intimate experience of cultivated crops. A Victorian farmhouse along the highway serves as a Visitors' Center. To the southeast lies an enormous complex of treatment facilities, including an additional 162 acres of extended aeration and oxidation ponds, densely vegetated treatment wetlands, and recycled water storage-- water that will be used to irrigate our agricultural crops, as well as many other sites in Sonoma County. Dividing these massive man-made landscapes, Ellis Creek flows down from the hills through a deeply shaded riparian corridor, becoming tidally influenced as it approaches the Petaluma River. Among the many art/restoration projects in the park are seasonal ponds for the "California Red-Legged Frog", a species of concern. The seasonal ponds are designed to fill with rainwater during the breeding season and dry up by autumn, to prevent predation by bullfrogs and fish. They also link the freshwater reaches of Ellis Creek to the freshwater habitats of the polishing ponds, and the elegant forms of the sculptural depressions (based on a local leaf and a flower, "Quercus lobata" and "Rosa Californica") are visible from the berm overlooks. Looking south, the landscape becomes open, tranquil, and mutable, with the tidal reach of Ellis Creek meandering freely through the marsh to the river. An inter tidal basin fills with water at high tide, and shorebirds foraging through the mudflats at low tide. Zoned brackish wetlands species-- bulrush, pickleweed, cordgrass, saltgrass, gumplant  line the margins, transitioning to high tide refugia and upland habitats. The sense of lonely serenity and closeness to nature (or apprehension and watchfulness, depending on the mood of the sea) is reinforced as the water rises higher and higher along the levee trail  ultimately leaving only a narrow path between wetlands and river. This trail, which forms the lower wing of the "butterfly", is a former agricultural dike that was breached during the winter storms of 1998. Sculptural bridges span the tidal breaches, offering a close-up view of both river traffic, and nature healing itself, as the natural processes of sedimentation recreate the original tidal marsh. Boat docks for canoes and kayaks along the levee trail and Ellis Creek link the Wetlands Park to the Petaluma Marina and historic downtown, as well as to the serpentine maze of wild tule marshes down river, forming a "water trail" that extends from city to bay. Part of my role as an artist has been to place the new water recycling facility within its larger context  the Petaluma River watershed. The Petaluma "River" is actually a shallow, twisting tidal slough, connected to San Francisco Bay and meandering through one of the largest intact tidal marshes in the United States  Petaluma Marsh. Framed by Sonoma Mountain to the north, and Olompali (now Mount Burdell) to the south, our site has a long history of productivity, processes, and art. By 1400 Olompali was one of the largest urban trading centers on the West Coast, and its inhabitants, the Coast Miwok, welcomed Captain Francis Drake to California in 1579. The Miwok caught salmon and steelhead trout along Ellis Creek with weirs (stakes pounded into the streambed and interwoven with willow branches and tules)  designed to funnel fish into beautiful hand woven basket-traps. Aesthetic duck decoys and branching deer headdresses aided in the process of hunting, and today we might call these artifacts "sculpture" or "site-specific art". The Miwok, however, did not separate art from daily life, nor did they feel unrelated to natural phenomena or processes. They believed a wide patch of moonlight on the ocean was the pathway to the spirit world, and their narrow beaten trails were sunk into the surrounding landscape, where every grove of trees, rock, and resting place had a name. The Coast Miwok lived in a unified world where life and death, seasons and cycles, art and process, were all part of the same design. While we cannot return to that halcyon world, it is possible for man-made structures to accommodate people, infrastructure, and living nature in more creative ways. The little "Dogface Butterfly", whose favorite food is manure, moves through a highly productive landscape rich in detritus and guano. The project itself offers many layers of public and ecological benefit  from water recycling, wildlife habitat restorations and school educational programs, to recreation, tourism, and art  while processing sewage and restoring a major site to the Pacific Flyway. Patricia Johanson’s multidisciplinary designs combine art, ecology, landscaping, and functional infrastructure. 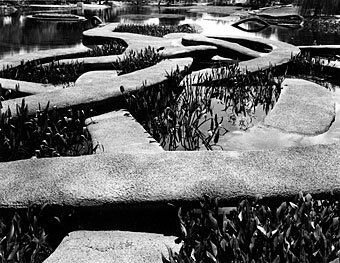 Major projects include: 150 gardens for HOUSE AND GARDEN MAGAZINE (1969), FAIR PARK LAGOON, Dallas(1982), SUNNYDALE FACILITIES, San Francisco (1988), and ULSAN PARK, South Korea (1996).